Rarely shy when it comes to speaking his mind, Eden Hazard has never hidden his desire to play for Real Madrid at some point in his career. He’s hinted to it many times, and while he’d also like to win the Ballon d’Or, he isn’t obsessed by it like other footballers (we’re looking at you, Antoine Griezmann), telling France Football in a rather lengthy interview he’s already got three at home, referring to his children. We’ve already covered his quotes about ‘frustrating’ Sarri, Conte and Mourinho, since they were released early online, but the Chelsea forward discussed other things, such as training under his current manager. Defensively, on the other hand, each had their own instructions for the good of the team. As for his future at Chelsea, well, that remains a mystery, even if the 28-year-old admitted to wanting an exit after the World Cup last summer. Asked specifically about Real Madrid, his first answer was ‘Why not?’. A huge fan of Zidane, admitting in the past he wouldn’t mind being managed by him, the winger won’t, however, wait for the former Madrid manager to find a new job and then leave Chelsea to join him. 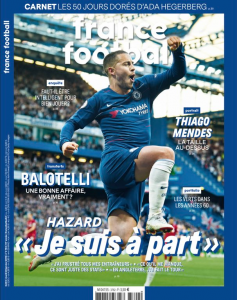 Finally, there were no questions about a Chelsea renewal, even if Hazard did admit he feels like he’s done just about everything he can in England.